The fruits of American ginseng mature in middle to late summer or early fall. American ginseng is a perennial herb. Its leaves occur in a whorl at the top of the single stem, and each leaf is palmately compound, with 3 to 5 leaflets. Small, insignificant greenish-white flowers emerge in May–July on a stalk emerging from the base of the whorl of leaves. A cluster of red berries is produced in middle to late summer or early fall. Height: to about 20 inches. American ginseng leaves occur in a whorl at the top of the stem, and each leaf is palmately compound, with 3 to 5 leaflets. There is an official collecting season for ginseng harvest; consult the Missouri Wildlife Code. Diggers can help by squeezing the seeds from fruits into the hole left after the root is excavated. American ginseng grows in hardwood forests on shady, well-drained, north- and east-facing slopes in predominantly porous, humus-rich soils, and often in ravines. American ginseng's small, insignificant greenish-white flowers emerge in May and July. In hardwood forests on shady, well-drained, north- and east-facing slopes in predominantly porous, humus-rich soils, and often in ravines. Long valued as a medicinal plant, particularly overseas, wild and cultivated ginseng is an annual crop in the United States and Canada valued in excess of $25 million, but overzealous collection is causing serious concern about the survival of American ginseng in the forest ecosystem. 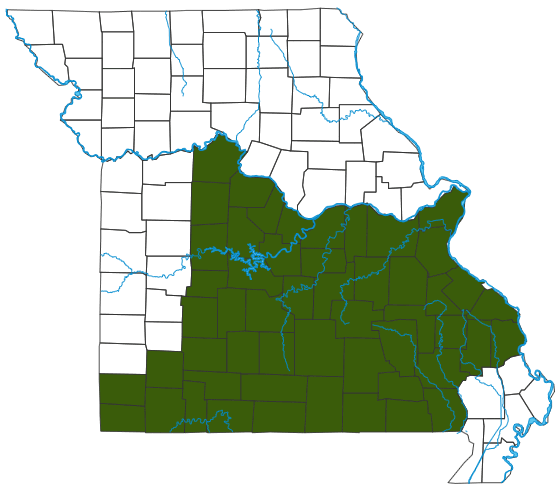 Scattered in the Ozark and Ozark Border Divisions; scattered to uncommon in the rest of the state. Apparently absent from most of the Mississippi Lowlands, Unglaciated Plains, and portions of the Glaciated Plains. More than 90 percent of Missouri's commercial harvest comes from wild plants. Because unlimited harvests have made ginseng decline or disappear in many places, harvest in some states is illegal. The ginseng trade is regulated internationally. It is also regulated under the Missouri Wildlife Code, with an official collecting season (usually Sept. 1 through Dec. 31, when fruits are on the plants). Please see American Ginseng Harvest Regulations below. Highly valued in Chinese herbal medicine, American ginseng root is dried and shipped overseas, where it is traditionally drunk as a tea. Recently, it has been put into a variety of other products as well. Oddly, most ginseng products sold in our country are made from Asian ginseng. In addition to humans, who have shown a pattern of overharvesting this plant, deer and other forest herbivores also consume American ginseng. Other threats to its survival include fragmentation and disruption of its habitat by human suburban and agricultural development.